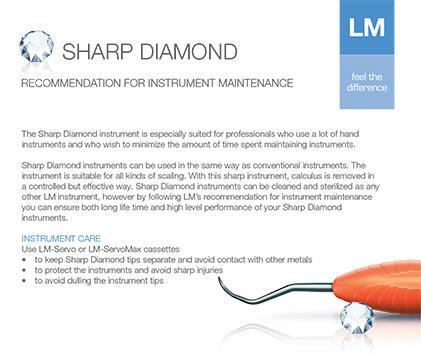 Sharp Diamond instruments are micro membrane coated instruments, which are completely sharpen free. The new coating is composed using modern Physical Vapor Deposition (PVD) technology, making the instruments razor sharp, extremely hard, yet smooth and light. Opposites attract. This holds true with high-quality, periodontal instruments. Optimally they are razor sharp, extremely hard, yet smooth and light. 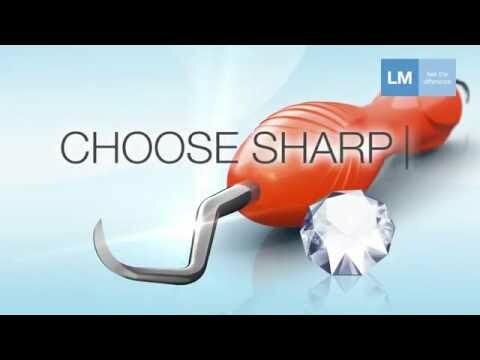 A new micro membrane coating made using modern Physical Vapor Deposition (PVD) technology enables LM to create Sharp Diamond instruments with the optimum combination of these features. 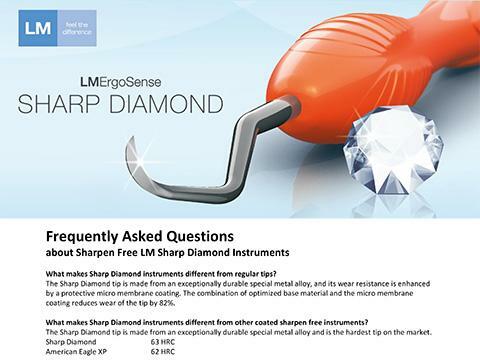 Sharp Diamonds are completely sharpen free, tough but refined, offering unique benefits for you and your patient. You will enjoy full control and improved tactile sense, while easily shaving off calculus instead of fracturing it. 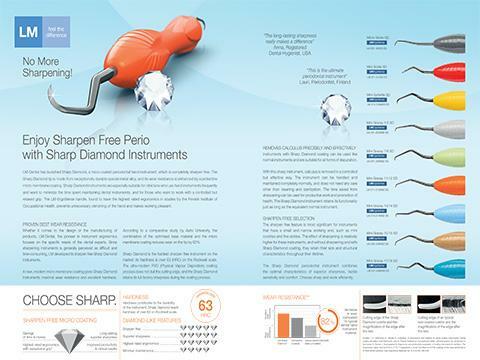 The sharpen free instruments are especially suitable for clinicians who want ergonomic, high quality hand instruments that naturally feels good in the hand, but also want to minimize the time spent maintaining dental instruments. Instruments with Sharp Diamond coating can be used like normal instruments and are suitable for all forms of depuration. Hardness contributes to the durability of the instrument. Sharp Diamond reach hardness of over 63 on Rockwell scale. Reference studies: * (1) Sormunen E., Nevala N: Evaluation of ergonomics and usability of dental scaling instruments; Dental scaling simulation and Field study, part III. Finnish Institute of Occupational Health, LM-Instruments Oy. (2) Nevala N, Sormunen E, Remes J, Suomalainen K: Ergonomic and productivity evaluation of scaling instruments in dentistry. The Ergonomics Open Journal 2013; 6, 6-12. ** Leppäniemi J. et all: The influence of PVD coatings on the wear performance of steel dental currettes. Key Engineering Materials Vol. 674 (2016), 289-295. Choosing the most ergonomic hand instrument can make a big difference in terms of discomforts and disorders when performing dental work. It is by no means insignificant what the diameter of the hand instrument’s handle is or what the material of the grip surface is. When holding the instruments for approximately 2,000 hours each year, the design, weight and feel of the instrument are crucial for the dental practitioner in terms of his/her performance and productivity. LM instruments are available with a selection of different handles. All exceptionally ergonomic due to the elastic silicone coating and optimized contouring. The clinician’s hand fit and indication both play a role in selecting an ideal handle type. Interchanging different handles, may place the user’s hand under even less strain. To facilitate color coding and brighten up working practices LM-ErgoSense, LM-ErgoMax and LM-ErgoNorm instruments come now in new refreshing colors. The name and the code number on the handle ease the identification of the instrument during clinical procedures and maintenance. The larger diameter and design provide sensational grip that has been proven to be ergonomic and efficient in scientific clinical testing. Uniquely intelligent handle with the option for RFID tagging. 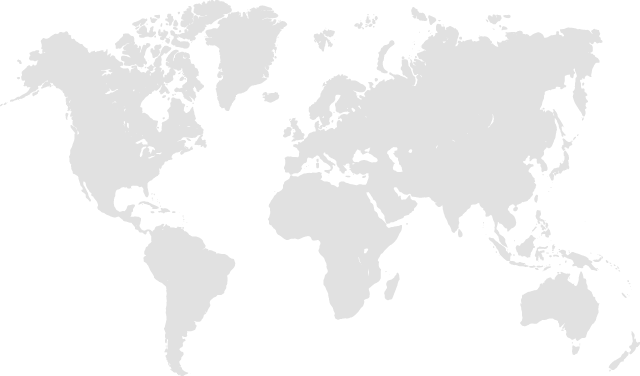 The compatibility with the Dental Tracking System offers many opportunities to improve asset management and patient safety (see more on www.dentaltracking.com). Classic ergonomic design that others copy. Functions well in all clinical procedures and guarantees excellent tactile sensitivity and relaxed grip. The thinner handle that functions best in light clinical procedures. The LM-ErgoMix handle for exchangeable tips offers all the economical and ecological benefits of retipping. Available for specific instruments. Well balanced mirror handle with better reachability.